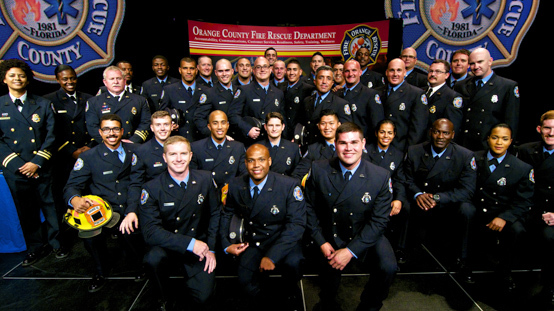 Orange County Fire Rescue held its Recruit Class 74 graduation ceremony at Full Sail University on Jan. 15. The large class – a total of 28 recruits — worked diligently for eight weeks to complete their firefighter, EMT and paramedic training. The ceremony welcomed family and friends of Recruit Class 74 as they were individually recognized for the completion of their training by Orange County Fire Chief Otto Drozd III. District 2 Commissioner Bryan Nelson served as keynote speaker for the ceremony and delivered an inspiring speech about his work in public service. The class consisted of 27 males and one female under the instruction of Lt. Martis Mack, Lt. Alex Santiago and Eng. Rodney Estepp. The program is centered on the department principles of Duty, Respect and Integrity. While the content of the program is varied, it is broadly divided into two categories – Fire and EMS. A blended approach to instruction is utilized and includes conventional classroom academics, practical field application, and skills-based testing evaluations. In the class video, which played during the graduation ceremony, the recruits expressed their gratitude to Chief Drozd for the opportunity to become an Orange County Fire Rescue Firefighter. The training took place at Orange County Fire Rescue’s Training Facility, Orange County’s Emergency Operations Center, and the Central Florida Fire Institute. For more information on recruitment at Fire and Rescue, visit Orange County’s web site. Citizens are also encouraged to follow @OCFireRescue on Twitter for breaking news and updates from Orange County’s Fire Rescue Public Information Office.